This One Matte Lipstick comes in a shiny ash colour plastic lipstick package and the lipstick shade name mentioned at the bottom of the lipstick. It is a pretty package which can get inside your pouch, I mean it is travel friendly. The texture of the lipstick is neither creamy nor dry, since they are Matte and I find the texture is pretty perfect that doesn't tug the lips at any point while applying. It has some sweet syrup smell but it is mild and doesn't last long. 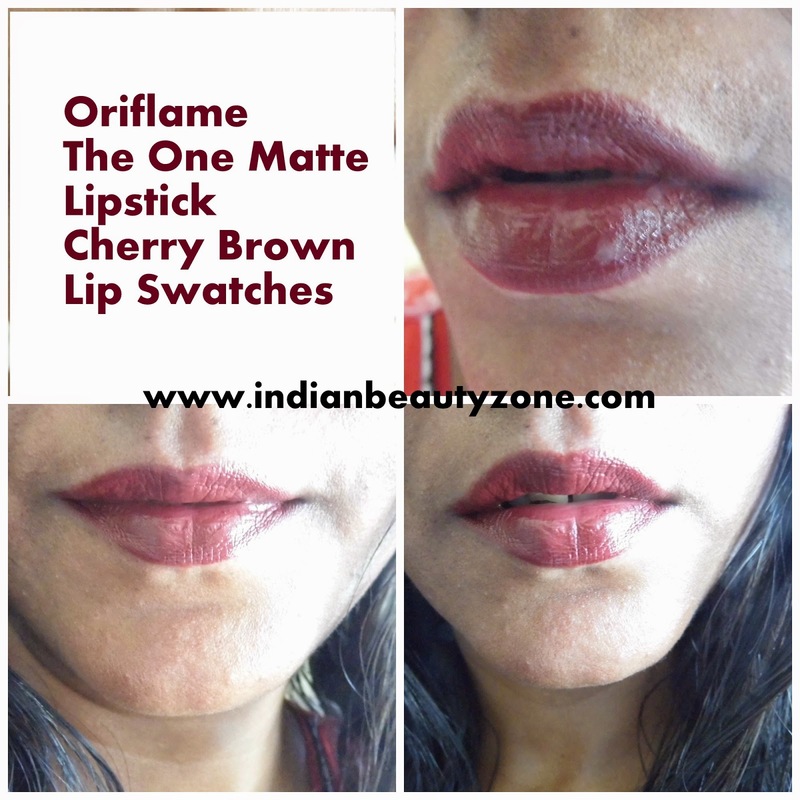 This Cherry brown shade is a very dark wine red shade and I assume it is the dark and deep lipstick shade from this Oriflame The One Matte Lipstick collection, call it a Vampy Red shade. Unless you are not a wine shade lover you may not like this lipstick, also it is a shade to more likable of old ladies. The most seductive shade from this collection, a beautiful Red Matte shade which I loved a lot. Well this is a shade for most Red lipstick lovers all the time. It is a bright Red shade indeed. You can wear this shade for your party or outings, you will rock. This is an another deep shade but it has slight pink hues in it which makes this lipstick very beautiful. I like this lipstick too and it looks perfect for my medium skin tone. It will be a best shade for party and bridal wear lipstick shade. The pigmentation is simply awesome and can hide my upper lip pigmentation beautifully. 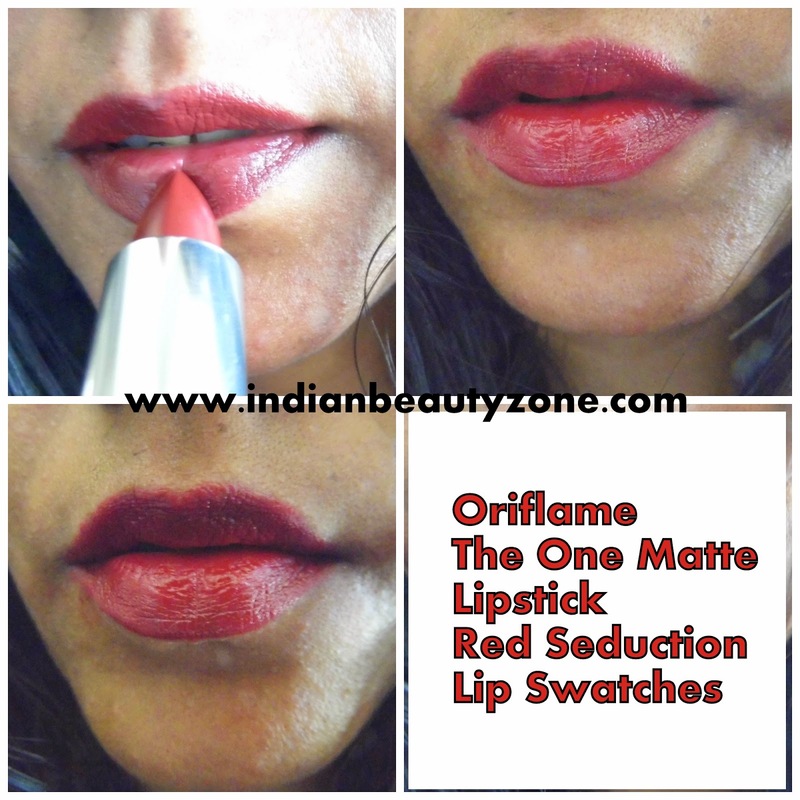 I am really impressed by this Oriflame The One Matte Lipstick's pigmentation, simply one swipe of this lipstick makes a beautiful colour payoff on your lips. I love the Red Seduction and Merry Maroon shades and yeah the cherry brown is also good but not my kinda shade, I though this shade will be like light wine in colour, but it is opposite to my expectations. The texture is very smooth and spreads on the lips very well and evenly. There is no complaints of dryness even after a long time for me with this lipsticks and it stays on my lips for really very long time, I can say until you wipe it off it won't go from your lips easily. It stays even after a meal too. 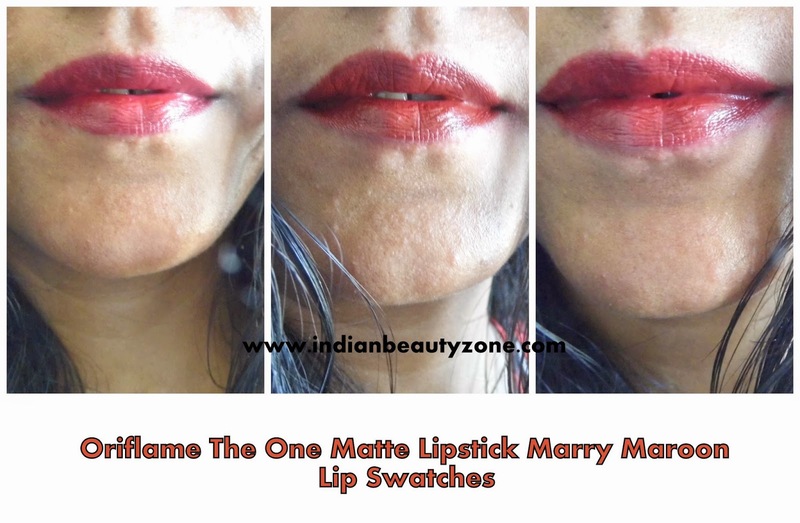 Overall I am in love with Oriflame The One Matte Lipsticks. Beautiful and awesome shade collection to choose. It is affordable when compared with the quality. It stays for long time. Red Seduction and Marry Maroon are really very suitable for medium skin tone. Smooth texture and doesn't dry out the lips. Easily and evenly spreads on the lips. Wow love all the shades n I love ur lip swatches rads . Some nice colors especially for a night out. I liked the shade! Red is something that I like to wear most..on every occasion thats why I keep looking for more and more Red shades and brands. Oriflame definitely comes on the top while choosing the brand for the quality it offers. Thanks for coming with such a nice product.